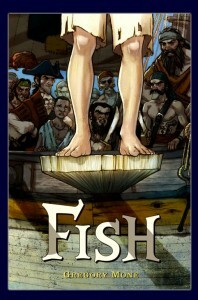 Fish is the story of Maurice Reidy, a boy who’s rather unremarkable save for his apparently inborn talent for swimming. Swimming comes as natural as walking for Maurice (who’s of course nicknamed ‘Fish’ by friends and family alike), but it’s a talent that’s of little use on a farm, and even less use when life finds Fish working for his uncle as a courier in the city. And so it would have continued, had young Fish not run afoul of some mischief during one of his routine runs. Not so routine, actually, as Fish had been tasked with a package of extreme import – so extreme, in fact, that pirates (and worse) seemed to spring from nowhere in an effort to acquire it at any cost. In his efforts to regain the stolen parcel, Fish winds up amongst the pirate crew – very briefly as a stowaway, but then as a new recruit. It’s a role that Fish doesn’t find immediately to his liking, but he soon learns that the pirate crew – like most groups – has a rather diverse membership comprised of good and bad alike. Fortunately, the captain and his inner circle are of the former group, although the first mate and many of the crew are distinctly of the latter. The world that Fish and his new shipmates occupy is more-or-less that of our own (albeit in the age of Caribbean piracy), filled with characters of conflicting loyalties and mixed agendas. Some have flaws that define them, others flaws they overcome. It’s a world of shades of gray, although somewhat simplified so as to make it more palatable to the younger audience. The children in the story are a little sharper than average, while most of the adults – heroes and villains alike – are just a tad slower than might otherwise be expected, thus allowing Fish and his young colleagues to better play a part in the story. And while this might keep “Fish” from having the same crossover appeal as some pirate children’s novels, it’s target audience will likely be perfectly pleased with this pirate adventure. This entry was posted in Books and tagged gregory mone, young adult by Bilgemunky. Bookmark the permalink.